3 Bedroom Beach lovers Paradise! This Indian Shores condo is a great beach front vacation rental! Watch the FANTASTIC SUNSETS over the Gulf of Mexico from your covered 7th floor oceanfront balcony. Take a stroll on the beach, relax in the warm sun poolside, or soak in the hot tub, all just steps away. Fire up the BBQ grill for that fresh catch or burgers at the on site picnic area. Enjoy new furnishings throughout the spacious condo! The living room and master bedroom open up to the beachfront balcony. Sleep comfortably in your large open master suite with king size bed, The second bedroom has two queen beds, and a double bed is in the 3rd bedroom. Linens and bath towels provided. The fully equipped kitchen has every convenience from home you desire. You won't miss a game on the cable tv and your family will be able to stay connected via internet during your stay on the beach. A washer and dryer is located inside the unit for your convenience. Parking for a single car is provided. Walk to several Indian Shores restaurants, shops and parks or rent bikes, a boat or jet skis. Visit the Clearwater Beach area for award winning beaches, amazing restaurants, nightlife, our local star “Winter” from “Dolphin Tale” at the Clearwater Aquarium. Enjoy wave runners, para-sailing, Segway, dolphin tours, deep sea fishing, dinner cruises at the Clearwater Marina. Make sure to go to the Pier 60 for the nightly sunset celebration. There are several area golf courses, only minutes away. Go to Johns Pass to experience their waterfront restaurants, fabulous shopping and water excursions. St Pete/Clearwater airport is 20 minutes away and Tampa International Airport is 30 minutes away. Busch Gardens, Adventure Island and the Florida Aquarium is only 45 minutes away. Orlando, Disney, Universal and Sea World, are all only 90 minutes away. Local sports include the Tampa Bay Rays baseball, Buccaneers football, Lightning hockey, the St Pete Indy Car Race, and the MLB spring training facilities. The Clearwater Beach area is a wonderful place to spend the winter, visit spring training, have a blast during spring break, a perfect wedding retreat, a romantic honeymoon or a much needed family summer vacation. Exactly what you want for beach vacation. The condo was absolutely breathtaking! Exactly as discriped! The views are awesome! Beds are comfortable and the condo is very clean. The pool was very clean and warm! Easy access to the beach. We didn’t want to leave. Love this area, not as busy as Clearwater and St Pete areas. This unit was exactly as described. We have stayed in the Sand Castle condo buildings for one week each year for the past 15 years. This unit was our favorite. It was clean, comfortable and had a nice decor. It is not "fancy"; it is "beachy"......which is what we like. Great location.....close to restaurants. I stayed in another unit in at Sandcastle 1 last year, and it was laid out exactly like this one. Very accommodating for my family. There were clothes left in a drawer in the bedroom along with garbage. These drawers were definitely not checked, let alone cleaned. There was a used toothbrush left in the bathroom. The rug in the living room was sticky and needs a deep cleaning. We found a pitcher of lemonade in one of the cabinets for some reason. I understand it is not feasible to deep clean a condo every Saturday betweens renters, but you could tell it hadn't been deep cleaned in quite some time. There was very thick dust on the furniture and under the beds. I brought these issues to Pinellas Vacation Rentals' attention via a response to an email they sent me, but I did not receive a response. Also: the check out instructions ask you to do clean and put away all dishes; however, there was a load of dishes in the dishwasher when we arrived. I love this location. Indian Shores is my favorite beach in the US. It is quiet and great for families, but you can be in Clearwater in all the action in 20 minutes. I will stay at Sandcastle 1 again, but not in this particular unit. I clean enough at home...I don't want to clean on vacation, too. We deeply apologize. That maid service has been replaced. Also, all of the old furniture has been replaced. Everything is brand news. We have an incredible time! My husband and I took our 3 adult daughters and our 6 year old on a 20+ hour drive to arrive at our condo in the middle of the night.. It was absolutely fantastic.. We all stayed up for another couple of hours, checking out the balcony, the beach, and the condo.. We stayed for a week and there honestly was not one thing that I needed that was not provided. We were so excited to find the beach activity assortment in the balcony closet.. were thrilled to be within walking distance of CVS, countless yummy restaurants, and the most beautiful beach.. and within driving distance of Clearwater Aquarium and all the many activities available there. We did a dolphin tour and drove out to Tarpon Springs, Sponge Capital of the World.. It was fabulous and we will definitely be back! Thanks! Clearwater is a quiet Florida town that boasts some of the most beautiful beaches in all of Florida. Wiggle your toes in the sugary soft sand, partake in the wide array of watersports available, or spend the day sightseeing. No matter what Clearwater activities you choose, you can't go wrong with a Clearwater vacation and iTrip Vacation's lineup of Clearwater condo rentals. Clearwater's diverse ecosystem has been gaining popularity as a leader in eco-tourism. With over 300 species of fish populating its waters, Clearwater is a prime fishing destination. The many local parks around our Clearwater condos provide the perfect setting for biking, hiking, bird watching, and many other nature-related activities. Clearwater activities extend past just beach fun. Get up close and personal with dolphins, sea turtles, and otters at the Marine Aquarium or visit the downtown area and take in a show or orchestra concert at the Ruth Eckerd Hall. There are also many shops near our Clearwater condos, a little something for every kind of shopper. At Countryside Mall, not only can you enjoy great shopping but also beat the summer heat on the indoor ice-rink located at the center of the mall. A Clearwater vacation can't be complete without an evening visit to Pier 60, a short distance from our Clearwater condos, to see the most beautiful sunsets in Florida. Each night Sunsets at Pier 60 celebrate the setting sun with live music, local arts and crafts and street performers. After a long day of fun in the sun, you'll be glad to return to one of our Clearwater condos to recharge and start it all again in the morning. 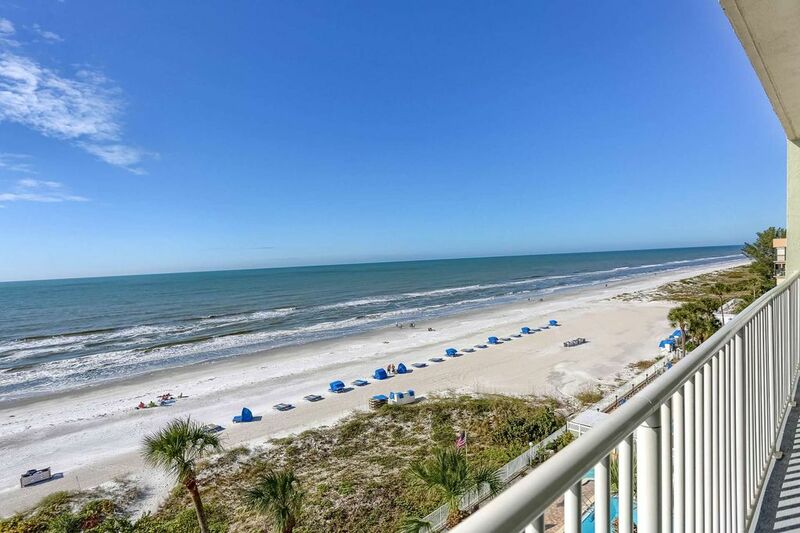 Here at iTrip Vacations, we know how important a truly spectacular vacation is and that is why we strive to offer only the best Clearwater condo rentals.